This is my calculation which I use when I want to see if there is a business case behind a media investment for my clients or my own marketing initiatives. There are so much information available today, and from that you can manually calculate predictions and potentials before you choose to invest in a specific media, channel or campaign. Armed with the right specific, relevant numbers for your business and some industry averages you can create a hypothesis for the potential for an investment if you are unsure, or just want to make a calculation in terms how you should re-distribute your media budgets and what the potential could be. Marketing today, merges business savviness and analytical skills. There is just a question of time (I guess there already is someone out there who has turned this into a formula, if not, that someone could make some nice bit of cash on a software for this, collecting data from advertisers, merged with some kind of ad score to calculate predictions based on data available). 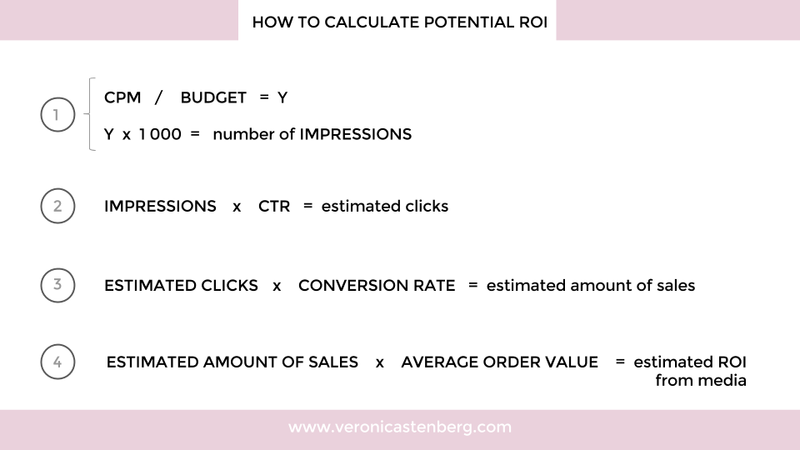 This is just a calculation of potential and you use averages and generic numbers for the CTR for example, it’s just to get a clue about the potential and what specific budget can generate. Your ads and landing pages, entire website and check-out process has a huge impact on if your campaign and marketing activities that your business do, are successful or not. If applicable, you may want to deduct the VAT from the final calculation. If applicable, you may want to do a second calculation on this, deducting a percentage, if you have that number, for any return rate you may have on your goods. If you are doing a campaign for various geographical locations you need the conversion rate and average order value for each country and website store. Each media needs to be evaluated and calculated separately. Since CTR and similar may vary from both media and country.